(Nanowerk News) David Williams is the first human being ever to have a new radiation treatment implanted in the center of his brain tumor. The technology, developed at the Cancer Therapy & Research Center at The University of Texas Health Science Center at San Antonio, uses tiny radioactive liposomes, or fat particles, only 100 nanometers across, inserted by the thinnest of catheters directly into a tumor. There they remain, radiating only a tiny distance, affecting only the tumor. Andrew Brenner, M.D., Ph.D., a neuro-oncologist, is leading the clinical trial at the CTRC, and expects to start the second patient on the study within a month. At his first follow-up appointment Monday, Williams reported feeling great, and said he did not experience the side effects that one normally does after conventional radiation therapy. That technology must send its beams through healthy tissue to reach the tumor, and so must be limited in the amount of radiation it delivers. "The technology is unique," Dr. Brenner said. "Only we can load the liposomes to these very high radioactivity levels." The concept was developed by nuclear medicine physician William T. Phillips, M.D., and biochemist Beth A. Goins, Ph.D., in the Department of Radiology; and Ande Bao, Ph.D., a medical physicist and pharmaceutical chemist formerly in the Department of Otolaryngology, all of the School of Medicine at the Health Science Center. They originally thought of trying it in head and neck cancers. But Dr. Brenner had a different idea. "I thought it made sense to use it in brain cancer first," he said. "The skull is a rigid structure" and the tissue inside is much less varied, he said, whereas in the neck and other parts of the head there are many different kinds of tissue and lots of moving parts. He worked with neurosurgeon John R. Floyd II, M.D., to apply the first treatment to Mr. Williams on March 10 at University Hospital. "One of the challenges is how to get the highly radioactive nano liposomes into the brain, and precisely into the tumor," Dr. Floyd said. "Surgical targeting, precision, and delivery became of the utmost importance." In the past, using a catheter to apply traditional chemotherapy has run into problems because of the catheter design, he said. "To effectively deliver this novel therapy, and improve our surgical targeting, we would need a better catheter. The one we are using is a new design, enabling us to deliver small quantities in precise locations. We are very pleased already with delivery in our first case." While not all brain tumors are malignant, the glioblastoma is especially deadly. To add to that, as the tumor advances it affects the brain in unpredictable ways, often involving radical shifts in personality and behavior. "It's a terrible thing for a family to lose a loved one to glioblastoma," Dr. Brenner said. "It's tough to lose them to any cancer, but with the brain tumor you see them change right before your eyes." The early research was incredibly promising, but to get a cancer drug to the clinical stage and see how it works in patients takes a mountain of work, a pile of money, and usually long years of regulatory processes. This particular project attracted the attention of the CTRC Foundation, which partnered with the Health Science Center to found NanoTx Therapeutics to help move the research into clinical trials. 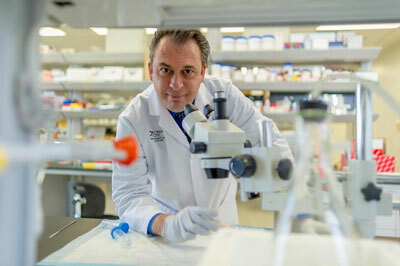 Working with NanoTx, Dr. Brenner wrote business and scientific proposals, gaining a $2 million grant from the Cancer Prevention and Research Institute of Texas in February. "It is exceedingly unusual for any major university or cancer center to take a basic science discovery from the lab all the way through the marathon of requirements and hurdles, and to then witness a patient receiving the treatment," said CTRC Director Ian M. Thompson Jr., M.D. "This is a testimony to our dedicated scientists and physicians, to our institution's commitment to major advances in clinical care, and to so many individuals in the San Antonio community who helped make it possible." It can be hard to explain to desperate family members that not everybody is eligible for a study, and that the study is just that - not a guarantee of cure. "You never know until you begin the studies how a human being is going to react to a new therapy, and we have to be very careful about how we proceed on that," Dr. Brenner said. And in this case it's not only the therapy that's new, it's how it gets to the tumor. "The main limitation right now is we have to start with small-sized tumors, until we get a better handle on our delivery methods, to make sure we can cover larger tumors," he said. Caution is the word on new therapies in general - that's why they go through such an enormous vetting process before they ever get to the first patient. But Dr. Brenner has a good feeling about this one. "I don't like to oversell an unproven drug," he said, "but I would like to say the laboratory results were very encouraging. I have evaluated a lot of therapeutics and I have not seen this level of efficacy before."